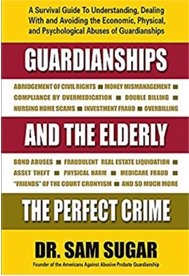 AAAPG Spokesperson Dr. Sam Sugar describes this national racket in detail in his recently published book "Guardianships and the Elderly-the perfect crime" (available on Amazon), Sugar suggests that anyone concerned about an elderly parent or family dysfunction that could lead them down the path to probate court read this book and become educated about the risks that face families when they ask lawyers and judges to become involved in their family matters. But their actions are the tip of a much much larger iceberg of similar exploitation going on all over this state and many many others. It bespeaks a deep level of hubris and arrogance when our Bar and JQC complaint departments willfully ignore an avalanche of complaints against the probate insiders all over the state for years. No lawyer who values his career is willing to take on the probate racket. No family litigant in probate equity courts, particularly those who cannot afford top-tier representation and appear pro se, has any expectation of even being heard by these equity judges who seem to believe that the estates that come before them for adjudication should rightfully pass into the hands of the lawyers who practice in front of them in order to line all their pockets with years of rubberstamped fee petitions for massive amounts of money so as to ensure that they are reelected.